My personal journey into serial composition doesn’t end up yet! Lately, I’ve taken a stab at applying the ten tones-row of Copland’s Piano Fantasy (1957) to the pattern assignment procedure I described in the previous post. I followed the coming outline (actually a semi-serial outline!). 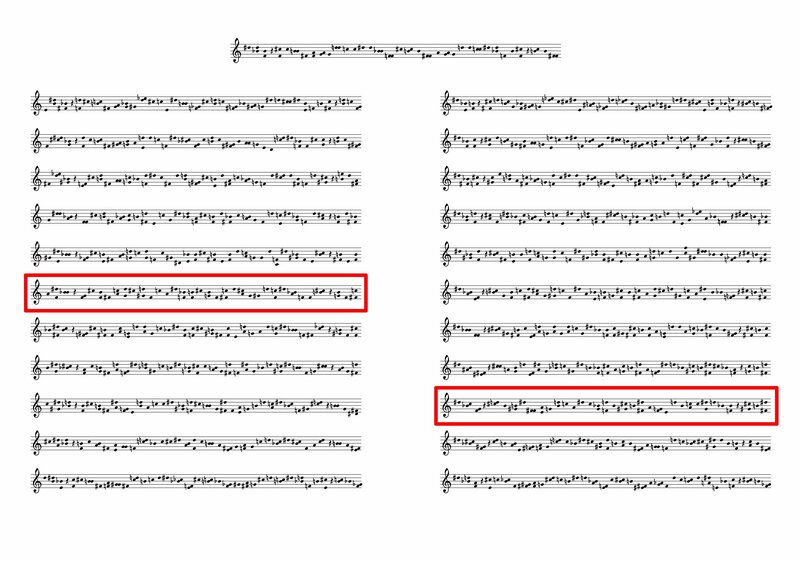 The row employed by Copland in the Fantasy is shown above. Then I systematically transposed one voice letting the other lying still and vice-versa (I wrote a Perl script to generate the LilyPond output shown above). I obtained the twenty-two pitch variants of the two voices alignment based on the original Copland’s row. Note that each variant/staff could be transposed further on with a resulting amount of 276 pitch variants of the same pattern alignment! Aaron Copland said that serialism is a “stimulus that enlivens musical thinking”. I think that this is the right way to approach to serialism. 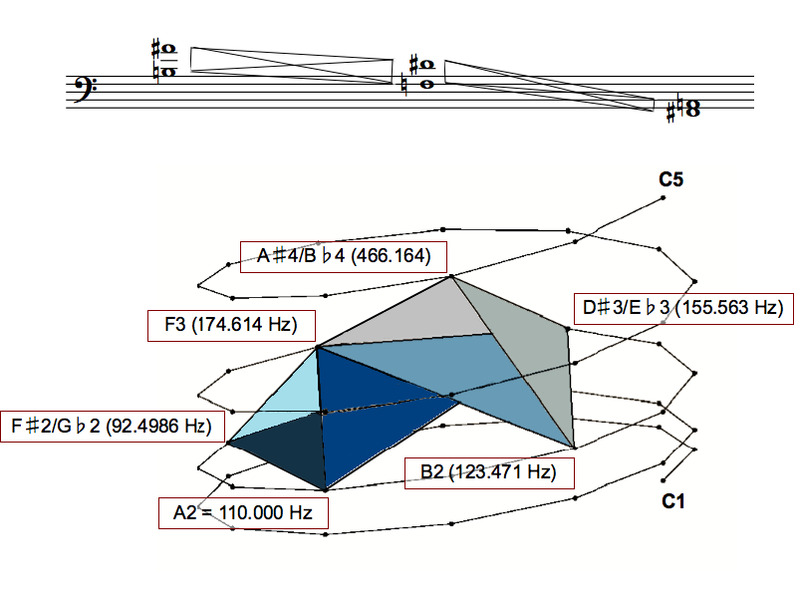 I’ve always been attracted by this elegant method of composition since I delved into Boulez’s totally serialized musical universe but I became to take an interest in serial composition after listening to some Arthur Berger’s works. I realized the expressive potential and aesthetic worth of this technique when it’s applied to tonal orientated material rather than simply chromatic rows. So I decided to put the principles into practice and design a simple serial outline. A _ _ _ _ _ . . .
B . . _ . _ . _ . C _ . . _ _ . . .
D _ . _ . _ . . .
E . . _ . _ _ . . The last instructions were not to duplicate the notes if the last and the first ones among two consecutive forms were the same and to respect the silence if there was a column of all dots in the alignment of the rhythmic sets. The evolution of the musical material is shown below (click image to enlarge). The result was bizarre but not so bad. So I used this raw material and the method shown above to compose a four-voices piece. Here you can listen to the result, a (terribly) flat counterpoint with harmonic references to stravinskian neo-classicism! March 03, 2010. Milan, La Scala Theatre. From the House of the Death, opera by Leoš Janáček. Esa-Pekka Salonen, conductor. 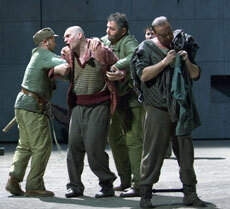 Staging by Patrice Chéreau. When rumors about this incredible production spread out, I was beside myself. So, when Decemeber came, my parents found the perfect Christmas gift for me and that blessed Wednesday of March I finally spent a great day in Milan! In the morning I went for a stroll in the elegant midtown, visiting the Sforza Castle, the Duomo, the Brera art gallery and taking a coffee break in the famous Caffè Cova. Then in the evening I dressed up and went to the opera. The show was awesome. I knew the Chéreau’s version (I saw a dvd in the past) and the result was uncanny as expected! 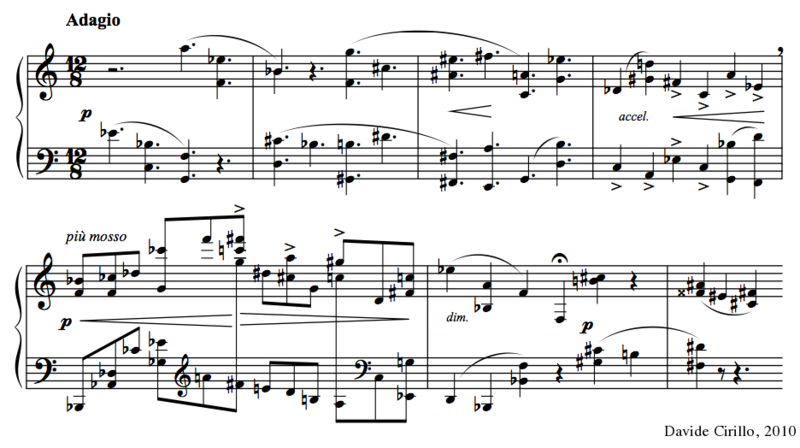 And the music… Janáček’s language is a living moody microcosmos. His music reminds me of those odd theories about emotional perception in plants! ^^ It seemed like the music reacted to what happened on the stage, not just only as a supportive vehicle to the action but as a character itself, flesh and bones, sympathizing, pointing out, giving and taking offence, suffering, moving… A living being! I massively appreciated the show. Salonen was great as ever. He started conducting not even come up the podium! I think the first violinist hated him for this! That was the first time to La Scala for me. I believe it won’t be the last and I hope the Opera Theatre of Rome will follow the example and set up interesting produtions like that. I uploaded a new video on YT last week. Excerpts from Prokofiev’s “Chout” arranged for cello and piano by the cellist Roman Sapozhnikov, very well-known in Russia for his Cello publications. The fact is that I decided to add a personal remark about this transcription in the description box in order to open a controversy over the Art of Arranging, especially its aims. I think that sometimes transcriptions are prone to give unsatisfactory results and Sapozhnikov’s attempt is the case to me. Performers’ skill is unquestionable, but that arrangement has always baffled me. It’s seems like Sapozhnikov viewed that transcription just as a tool for showing off cellists virtuoso abilities, while the score itself pales in comparison with the richness of the original orchestral suite. So why downgrading a masterpiece that way? Liszt had the good approach: he transcribed work of others in order to promote music of not very well-known composers but at the same time he reached artistic top in composing paraphrases of many of the works he transcribed. What I’m trying to say is that good chamber music is that one which is born as and meant to be just chamber music. No one answered me till now but the kind ViewerNotes who evenly said that a transcription always debases the quality of the original work. Maybe it’s all in my mind but it’s quite frustrating when you are so used to the original work and run into a completely different version. Probably because “Chout” has a so unbelievably lush orchestration! By the way, I’ve got a piano transcription of Apollon﻿ Musagète: fine to play, useful to understand the score but definitely negligible compared to the original string orchestra result… Would it make sense to perform that transcription in a concert? No it would not. Maybe just as an encore. Actually ViewerNotes gets right to say it’s just a matter of exhibitionism or more likely of business… Check out yourself!